I was SO excited to make this recipe. I LOVE twice-baked potatoes, I love mushroomies, and I like chicken. Everything about this recipe sounded great. 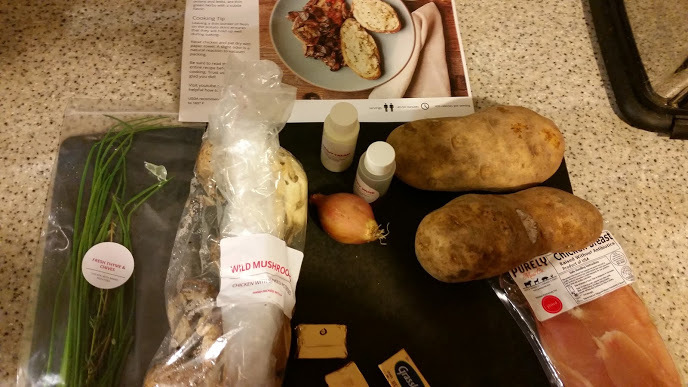 And then I found a moldy potato in my Plated shipment. I’ve already e-mailed customer service and have yet to hear from them. It was white fuzzy mold, you can kind of see it in the middle of the bottom potato. So that kind of put the whole meal on a downward spiral. 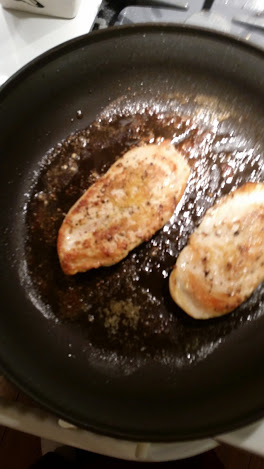 I had some small Yukon potatoes, so I split the one good potato between the two plates and used the Yukons for the mashed part. Somehow I ended up burning myself on the tiny potatoes and then was practically crying in the mashed potatoes, but hubby came in and saved the day by coming into the kitchen, calming me down, and helping wash dishes and make dinner. Overall it took 49 minutes, within the 40-50 minutes Plated anticipated. The mushrooms were mostly clean, but I did wipe them with a damp paper towel to get any dirt off. 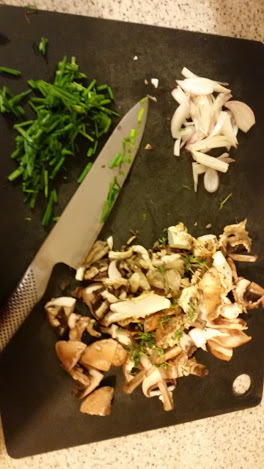 Not too much chopping in this one, just the scallion, chives, and mushrooms. My husband isn’t the biggest baked potato fan, but he did eat all of his. I think it helped having the Yukon potatoes mixed with Plated’s russet one. This was the first time I’d ever made twice-baked potatoes, it was a lot easier than I had anticipated, but it was hard to scoop out the potato and leave the exact right amount of edge. The mushroom sauce was amazing, I could have eaten a lot more of that, but then it would have been more than 490 calories. 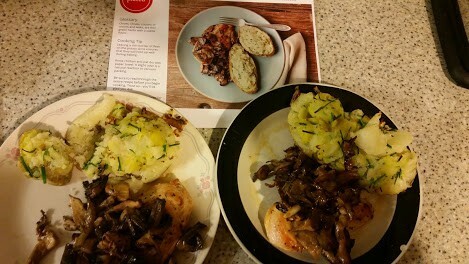 Despite the moldy potato, this was another great meal from Plated.